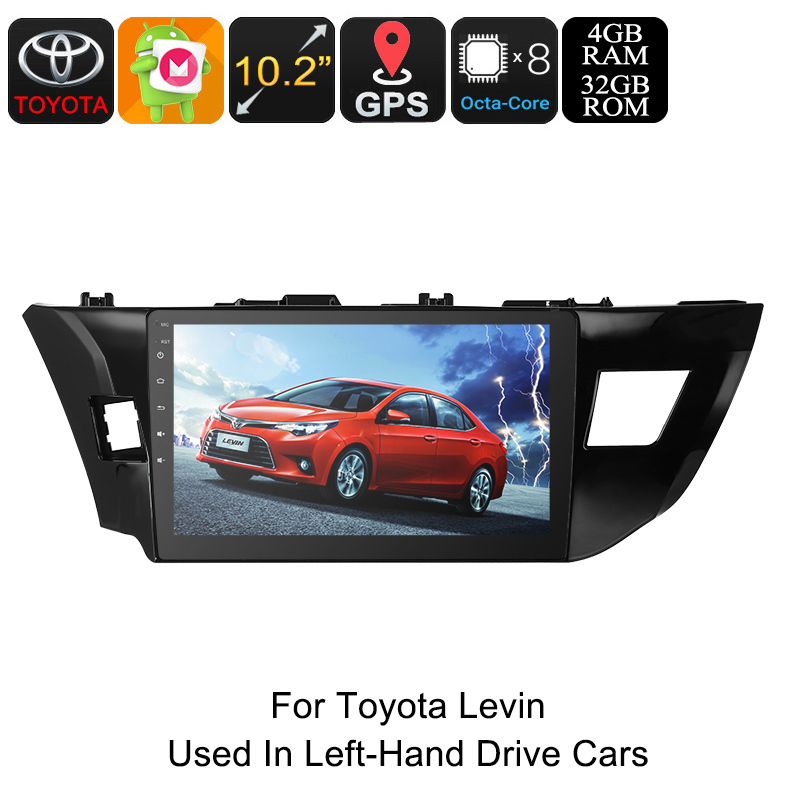 Successfully Added One DIN Car Stereo - For Toyota Levin, 10.2 Inch HD Display Android 8.0.1 GPS Octa-Core, 4GB RAM, WiFi, 3G&4G CAN BUS, Bluetooth to your Shopping Cart. This 1 DIN car media player provides you with the ultimate way to pimp up your Toyota Levin (model 2014 – 2017). By putting a large 10.2-Inch display into your dashboard, this one DIN car stereo lets your passengers enjoy movies and games while in your vehicle. It even supports WiFi and 3G connectivity (dongle not included) thanks to which you’ll be able to browse the web in your car. Download Applications, stream movies, or call to friends – nothing is too much for this Android media player. Naturally, it also supports regular FM/AM radio frequencies and Bluetooth. This lets you enjoy your favorite songs and radio talk shows whenever you’re driving your car. By packing an Octa-Core processor and 4GB RAM, this car stereo is capable of handling demanding software applications. Besides all its entertainment possibilities, this car accessory features a highly accurate GPS navigation system. The next time you head out on a trip you can leave your home with confidence as you can be guaranteed you’ll never get lost again. Your car media player features a simple design that can be easily installed. Simply place it in to your dashboard and you’ll be able to enjoy all the amazing features it has to offer. The Android 8.0.1 operating system of this car media player brings forth a smooth performance. It lets you enjoy all the latest software features that you’re used too. With 32GB of internal memory, there is plenty of space to store your Android maps, music, movies, and more. Additionally, this car gadget supports external data input through USB and SD card. No matter your needs, this 1 DIN car stereo lets you enjoy entertainment and navigation on a stunning HD display. This One DIN Car Media Player comes with a 12 months warranty, brought to you by the leader in electronic devices as well as wholesale electronic gadgets..